We have this data and I’d like to get it on the site soon. 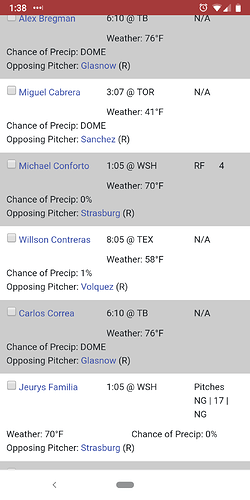 I’m curious if any other fantasy providers show this information. If you have an example from another site, please share it here. 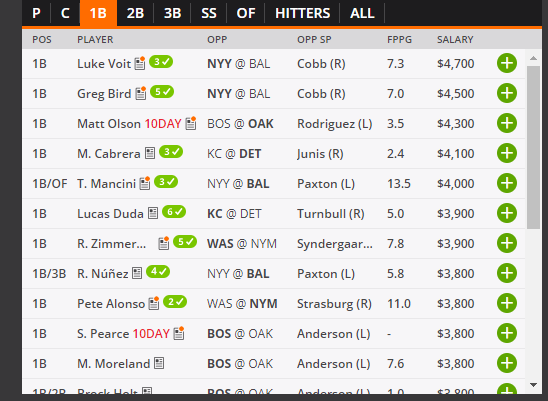 Here’s a screenshot from DraftKings. I think the checkmark is unnecessary and makes it harder to read the number, I’d prefer just the number shown. I use baseball press. Does batting order, weather, rp pitch counts, sp info. Ok, batting order is now being displayed for all hitters and NL pitchers. I may remove it for NL pitchers, just happened to work out that way. Sweet! Do you mind adding the number of points the player is going to score today? Niv – I like this addition and thanks. One suggestion: the batting order number is a little too bold and large for my taste. Maybe this is just getting used to the new element, but my eye is draw right to that number and it has more visual weight than most of the other, arguably more important, information presented on the page. It feels a little clutter-y to me in that way. Maybe not bold or smaller or something? I’m sure you love graphic-design suggestions so feel free to ignore. I’m happy with how this looks for now, but will consider this feedback in the future. Congrats to @jsquared3 for their new Genie badge. Very cool. Font size and color are perfect. I actually like the current look with the inverted number. That distinguishes it from the other stuff. Yeah I forgot to bump the CSS version to clear caches at first. This is how it was supposed to look the whole time.